STARTING IN LONDON. The 94th edition of the greatest spectacle in bicycling begins tomorrow, July 7, 2007. The Tour de France initiates, for the first time, on the streets of London. What an awesome sight that will be. Daily TV coverage will be on Versus (formerly OLN) and several online resources will carry live audio and periodic updates and graphic summaries of the progress of each stage. It is estimated that over 3 billion people will tune in to the Tour de France at some point during the next three weeks. 3547 KILOMETERS IN 21 DAYS. 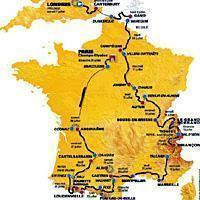 The Tour route is different each year, but always provides a wide range of terrain, beauty, and pageantry as it circles around France, making forrays into England, Belgium, Germany, and Spain. The Prologue (a time trial on Saturday, July 7) and 20 day-long stages will cover 3547 kilometres (that's 2204 miles) of riding, starting in London and ending in Paris. There will be 11 flat stages, two individual time trials and six mountain stages, including three grueling mountain-top finishes. The three-week ordeal will include two rest days. What better way to enjoy "dog days" and the month of July? LEADING AMERICAN. Levi Leipheimer is the best-placed American in this year's Tour. Now riding for the American-based Discovery Channel team developed by Lance Armstrong, Leipheimer has placed in the top 10 several times. He has a chance to finish on the podium in Paris (top three). Leipheimer will be assisted by a strong team that includes former Armstrong lieutenant George Hincapie. TOP CONTENDER A KHAZAK. The experts and many of the Tour de France participants think that Alexandre Vinkourov of Khazakstan will be wearing the Yellow Jersey, the Maillot Jaune, when the Tour concludes in Paris on July 29. Vinokourov has been a hard-charging rider for several years, performing well both in time trials as well as mountain-climbing stages. He has won several stages in past Tours de France. "Vino" is explosive and powerful, but tends to be ride like a lone ranger. It is yet to be seen if he can work well enough with his team to win the race outright. DOPING CHALLENGES. Make no mistake: charges and confessions of the use of banned performance-enhancing substances have thoroughly rocked the world of professional cycling over the past year. The verdict is still out on what happened with last year's Tour winner American Floyd Landis that his blood samples showed elevated levels of exogenous testosterone after one stage. One former Tour de France winner, 1997 Danish rider Bjarne Riis, has confessed to using EPO the year he won. Top contender Spaniard Ivan Basso has confessed to working with a physician to hide his use of banned substances and blood transfusions. Others have confessed or been accused. Laboratory integrity and anti-doping procedures have been called into question, also. It's a grand mess right now. Still, any rider currently under investigation for doping in any way will not be permitted to start this year's race. All riders are subject to urine and blood samples at any point during the race. Doping remains a challenge for this and many other professional sports and athletes. BUT THAT WON'T SPOIL IT. While some riders may somehow slip through the doping dragnet and others may be falsely accused, the system in place is trying to vigorously address illegal doping to end it. Still, when we look at the raw challenge of the Tour de France, we are looking at one of the greatest physical and mental tests in the world of sports competion. These cyclists are incredibly-trained, highly-disciplined, and thoroughly-dedicated athletes. They are riding over the most challenging course (parcours) in the world. It will test them in every way. We will witness a thing of beauty. Hope you can tune in at least every now and then. Cyclingnews - Online coverage: updates every two minutes, good daily summaries and photos for each stage. Also, good video clips. Follow appropriate links. Official TdF site - Online coverage: updates every two minutes, daily summaries and some video clips. Not a good source for photos. Follow appropriate links. Velonews - Online coverage: periodic updates during each stage, some streaming video, and daily summaries. Follow links. Cyclingfans - During the race, this site offers links to live streaming TV/video coverage via various internet TV sites around the world. Patchy, but fun to watch online when available. Yahoo!/Eurosport - Online coverage similar to Cyclingnews, but offers more of a European perspective and slant. very good Tour France !!! !